As of Jan 2014, Razor offspring have won 4 Judge's Choice, 1 Spirit of the Fiber Industry Award, 25 Championships and over 70 Blue Ribbons! This beautiful solid maroon dam has a 17.1 micron test when she was imported in 1996. 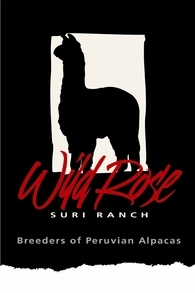 She is an excellent producer from breeding, birthing and milking, to mothering and attending her crias. 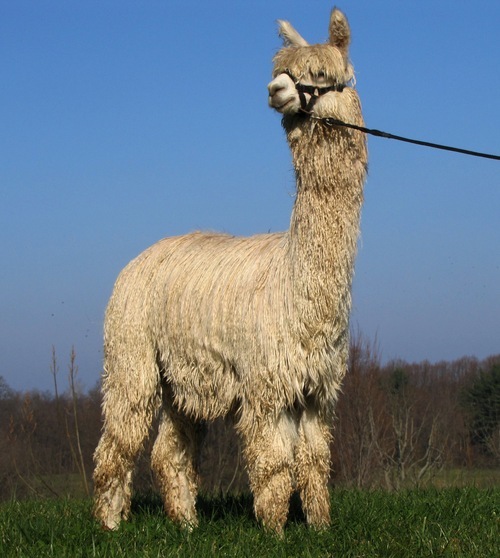 She produces strong, healthy crias each year. Ask for Price Champion Razor daughter! We fell in love with Fiesta from the day she was born. She popped out with this tremendous glowing luster that she still retains today, along with beautiful lock architecture. 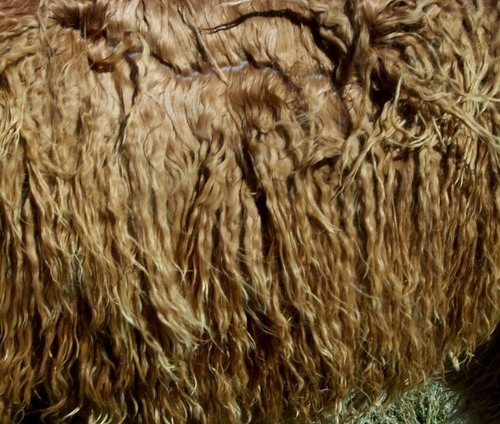 She is always the one of the first you notice in the pasture because of her presence, personality, and exquisite fleece. 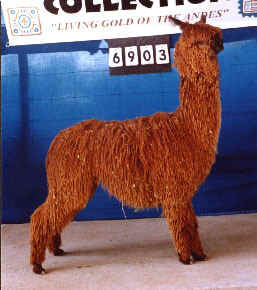 Fiesta has placed very high in every show she has been entered, winning 2 Reserve Championships in Halter and 2 Color Championships in Fleece. 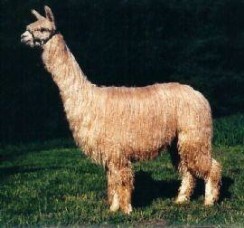 Fiesta produces high quality show crias, like her light fawn male out of Accoyo America Encantador, the 2007 Futurity Auction high-selling suri. 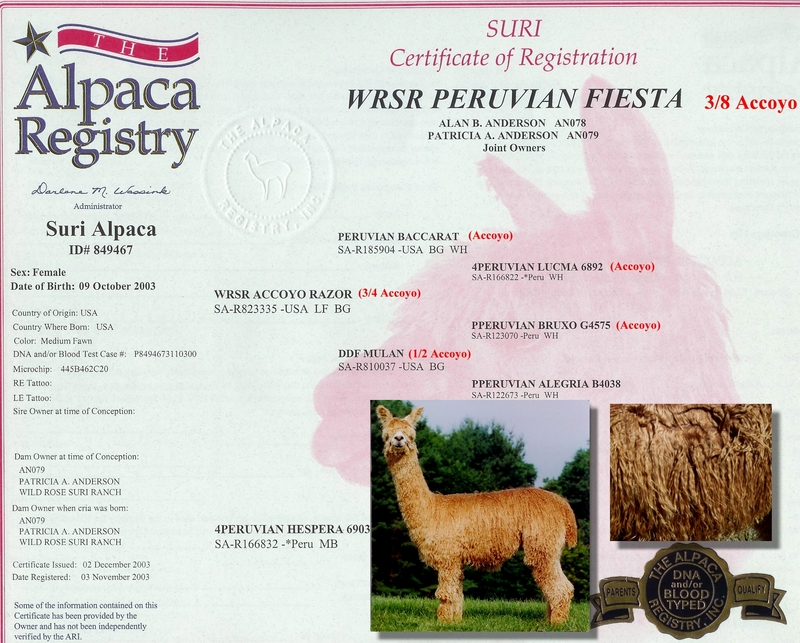 We are pleased with "WRSR Peruvian Zodiac" who has beautiful luster, coverage, and great lock architecture. 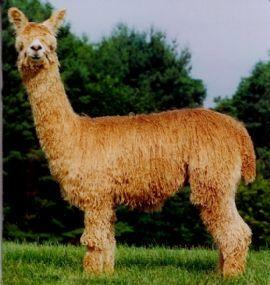 Her last cria is a white/beige female, WRSR Faith by Jimbobway, born 6/3/2012 with very pretty high luster ringlets and a showy conformation and presence. Fiesta shears between 6-8 lbs of fiber each and every year, with BLANKET weights between 3.0 and 4.5 lbs. It's easy to see why she has been one of our foundation dams. She has a very sweet personality and is an easy keeper, just a pleasure to have on the farm. We offer her for sale as we need to reduce our herd size due to increasing family health challenges. 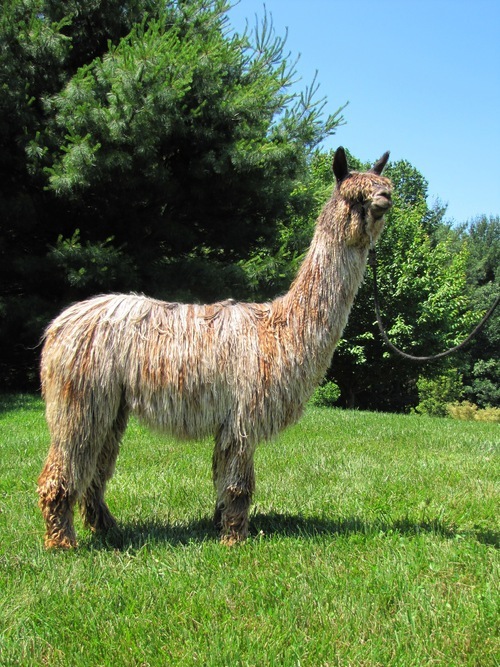 She is currently open and ready to breed for a 2016 high luster cria. She gets pregnant usually on the 1st breeding, and has a nice personality when pregnant, making her easy to handle. This is a great opportunity to add a top foundation dam to your herd! Fiesta is bred to Fusion, our Champion grey/fawn appaloosa with big spots. This combination of Razor and appy genetics should produce an appy cria with a fine, dense, fleece.